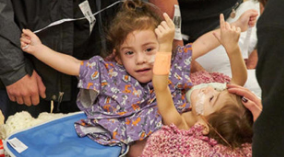 Conjoined twins since birth, Erika and Eva Sandoval, survived a marathon surgery. Wednesday, December 14th, both of them shared most of their lower body. Their mother, Aida, said doctors told her earlier on in her pregnancy that the twins might not make it. She was also told that her own life could be at risk, too. Afterward, Aida made the decision to embark on separating the twins. Now, each girl has a portion of their vital organs. Each only has one leg. They went to Lucile Packard Children’s Hospital Stanford, in Palo, Alto, California. It took a team of 50 doctors, nurses, and operating staff 17 hours to complete the separation. The twins came through in good shape. “It’s amazing how strong these girls are, and it’s amazing what their team performed,” stated the twin’s mom. However, for the two weeks following the girls were monitored in intensive care. Their physicians anticipate that they will spend an additional two weeks in the hospital before going home. While the girls are recovering, a world of support surrounding them is bursting with heartfelt messages from families, friends, and even complete strangers. The family said that they are so thankful for everyone’s support.